Except for the patrons of rarefied restaurants for whom exquisitely hand-crafted miniature food represents the triumph of artistic appreciation over animal hunger, most people like food in quantity. Even if they do not eat a great deal, they like the idea that they could if they wanted to. 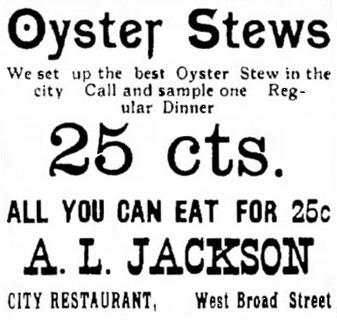 Restaurants advertising free seconds — or thirds — can be found in the 19th century, one example being the City Restaurant in Elyria OH in 1896 [shown here]. But it wasn’t until the Depression of the 1930s that the all-you-can-eat idea became a newsworthy phenomenon. In response to declining business, restaurants such as Childs in the East and Boos Brothers in the West took advantage of falling food prices by offering patrons as much of whatever they wanted for a set price of 50 or 60 cents. In this Depression experiment restaurant proprietors learned something important about how people react when offered unlimited food. A few people went crazy, stuffing down as much as they could [below: Peter Rabbit cartoon by Harrison Cady, 1933], but most didn’t eat more than they normally would. If they overindulged in anything, it was desserts. All-you-can-eat as an adaptation to challenging economic conditions did not altogether disappear with the end of the Depression. Many restaurants found that having one night a week when they offered a special deal on a particular food, especially fried chicken or fish, could fill the house on a perpetually slow weeknight or help to build business generally. Smorgasbords based on Swedish hors d’oeuvres tables also made their debut in the 1930s. 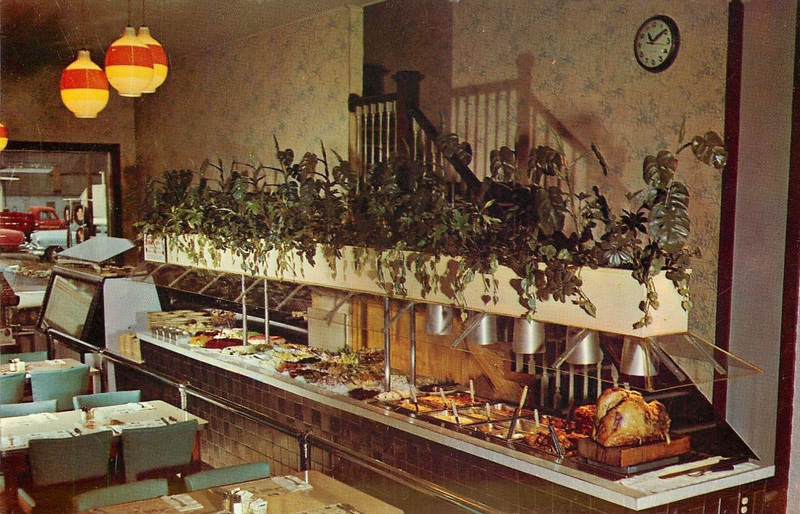 At Childs and other Depression all-you-can-eat restaurants patrons relied on a server to bring their order, but smorgasbords introduced a novel approach: patrons helped themselves to relishes and appetizers from an attractively laid out table, and were then served with their main course as in a traditional restaurant. The smorgasbord idea, it turned out, was a step on the way to the all-you-can-eat buffet. 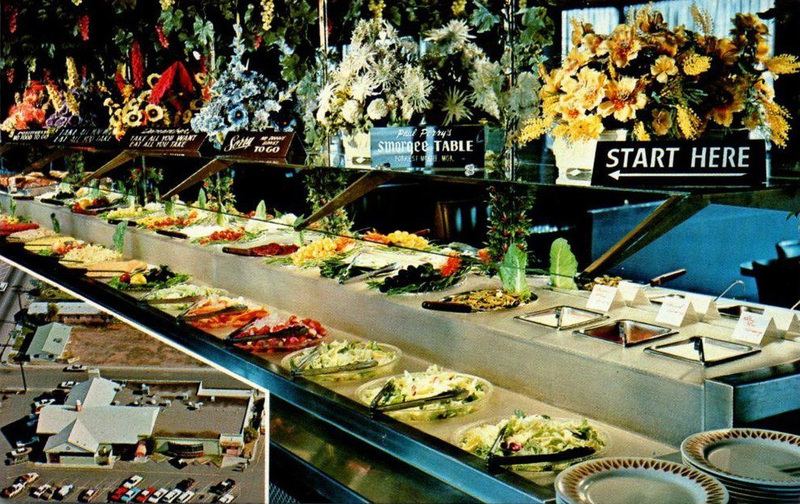 In the 1950s and 1960s chains developed whose entire business plans were based on bargain-priced buffets abounding with macaroni and cheese, chow mein, fried chicken wings, and “sparkling salads,” i.e. jello. Chains divested smorgasbords of their ethnic overtones even as some continued to call themselves by that name. In California, the word “smorgy” emerged (variations included smorga, smorgee, & smorg-ette). Rather than using round smorgasbord serving tables with food presented in decorative bowls and platters, high-volume chains tended toward cafeteria-type service with stainless steel pans. California smorgys displayed seeming cultural diversity, with Ramona’s Smorgy, Mario’s Smorgy, and Gong Lee’s Smorgy. I’m still trying to grasp the concept behind Johnny Hom’s Chuck Wagon/Hofbrau/Smorgy in Stockton CA, the town that may have merited the title of smorgy capital of the U.S.A. 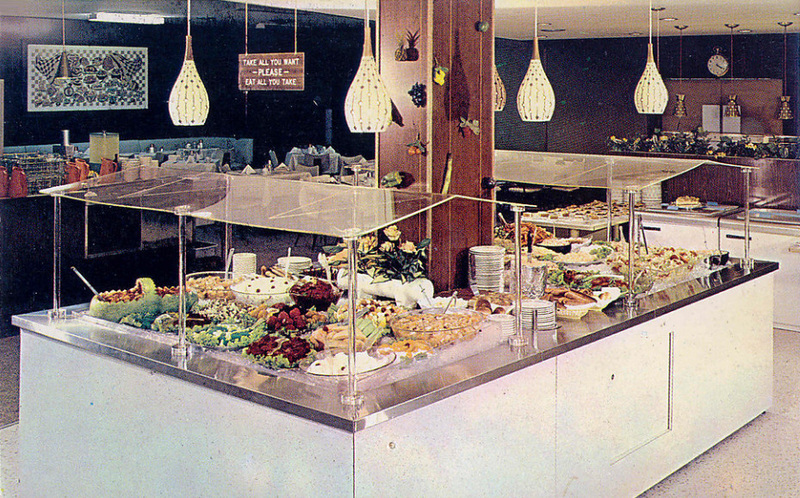 Along with the Swedish smorgasbord tradition, the spread of buffets and smorgys nationwide may have been aided by the $1.50 midnight spreads in Las Vegas casinos, which in the 1950s gave all-you-can-eat a popular culture imprimatur. 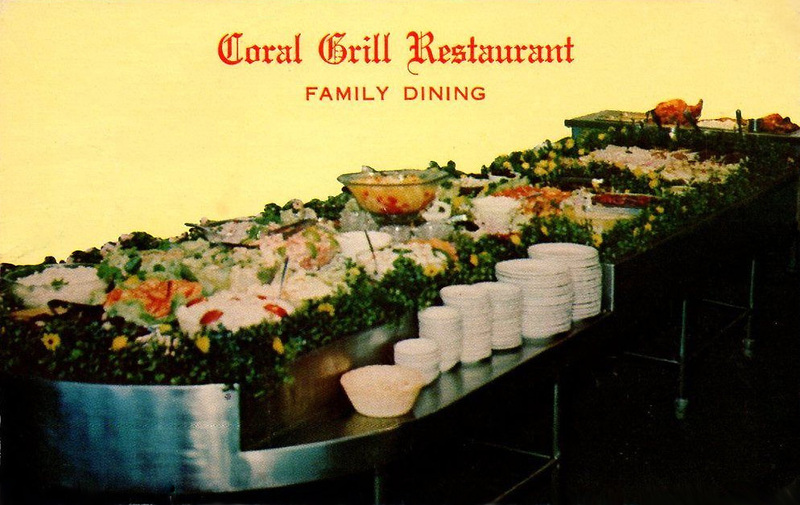 Opinion has been divided as to whether all-you-can-eat (or the more genteel “all-you-care-to-eat”) restaurants tended to serve cheap and inferior food. Many restaurants stressed that they baked daily, made their own sauces, or used fresh vegetables. 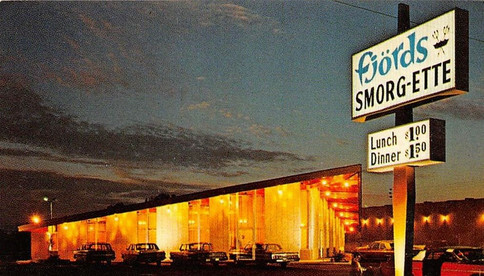 “At Perry Boys’ Smorgy Restaurant, an inexpensive price doesn’t mean a cheap product,” according to an advertisement listing brand name foods in use. 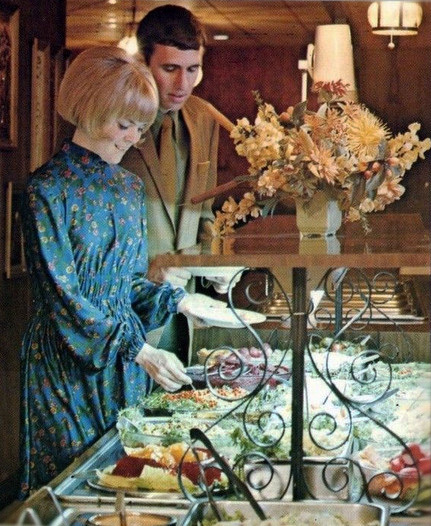 Yet, a 1968 restaurant trade journal seemed to suggest otherwise judging from its advice that “attractive buffet fare based on low-cost foods is essential.” For Quick Chicken Tetrazzini, it recommended mixing pre-cooked diced chicken with condensed mushroom soup and serving it over noodles. As popular as all-you-can-eat restaurants were in the 1960s and 1970s, they suffered in the public relations department. They often undermined their own mini-industry with insults slung at each other. Is it helpful while touting your own restaurant to remind the public that “the words ‘all you can eat’ often mean quantity at the expense of quality”? And what does it say about the many restaurants advertising fried perch specials when a competitor says of its fish: “This is NOT frozen perch”? Likewise some operators took an unfortunate “the customer is not always right” stance by posting signs that warned patrons to take no more than they could eat [see above: “Take all you want. Eat all you take.”]. This was directed at those, admittedly a small minority (but still! ), who came equipped with plastic-lined handbags or special pouches in their coats in which to stow food to carry away. Meanwhile, other proprietors denounced these warning signs as an insult to guests. Customers with huge appetites were another species of problem that most all-you-can-eat restaurants tried to be philosophical about, figuring above-average consumption would be balanced by the light eaters. Proprietors told themselves that the man who downed 90 steamed clams, or the one who swallowed 40 pieces of fried chicken, would provide free advertising when he boasted at work how much he ate. Families were prized customers, construction gangs less so. And they dreaded school football teams. Some restaurants located near the University of Michigan in Ann Arbor found it necessary to put restrictions on salad bars. Let’s face it, since the fall of Rome, gorging has been seen as unattractive. Restaurant owners and employees sometimes expressed disgust at customer behavior such as grabbing food off trays as staff tried to replenish buffets. “It’s disgusting,” said the proprietor of a Dallas all-you-can-eat steak restaurant, adding, “Some of them just ought to be led off to a big, old hog trough.” Another manager admitted that workers called customers “animals” in private. “You lose your appetite working in a place like this,” said one. As a reporter wrote of Las Vegas buffets in 1983, “If I ever see another metal pan of mashed potatoes awash in melted margarine, another sea of macaroni salad, another ‘medley’ of canned corn, carrots and peas . . .” Stop right there!